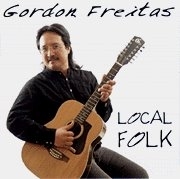 "LOCAL FOLK is a brilliant debut album of sixteen original songs penned by local performing songwriter, Gordon Freitas (fray'-tess). Each song is as captivating as the one before it, weaving a story instantly familiar to anyone who has lived in these islands. Freitas finds a fresh way to weave his acoustic guitar, mandolin, ukulele, dobro, harmonica and Hawaiian lap steel guitar into a roots-based foundation for some wonderful music." This album was deservingly awarded recognition in two categories at the 1998 HAWAI'I MUSIC AWARDS. Freitas "establishes himself as a master of lyric prose as he melds each word seamlessly into a sensibility that bridges intellect, taste and honesty with catchiness and commerciality. This stuff is pure and uplifting folklore that captures difficult to express island themes with great clarity and eloquence. The music is as local as it is folk; totally refreshing, delightful and immensely entertaining!" (Liner Note by Peter Apo) Truly a regional portrait of a cultural melting pot, painted in the lyrics of an island boy who grew up on the road across America with eyes open wide and ears tuned in to the winds of the world ! "The entire LOCAL FOLK album was made up from observations of local people in paradise. The title track, "Local Folk" touches on several topics including the spirit of ALOHA, Hawaiian star navigators, missionaries, a sunken battleship in Pearl Harbor, sovereignty, paniola cowboys and Hawaiians livin' on the far shores (mainland kine). The song acknowledges the people of Hawai'i as colors of aloha... the blending of cultures that have simply become known as "local style"... and "local people" everywhere who seem to be bonded by more than just sheer location." The CD package includes an eight page booklet packed full of aloha and with all the lyrics. There's even a paniola Hawaiian cowboy yodeling lesson in this deal. Yo-da lay hee-tee! "I wrote these songs so folks who came to the islands could learn a little bit about our local people and the events and things that touch our lives"
Where the black mountain spirit of the jungle still reigns.